Children are becoming more trusting of what they see online, but sometimes lack the understanding to decide whether it is true or impartial. Ofcom's Children and Parents: Media and Attitudes report, published recently, reveals that children aged 8-15 are spending more than twice as much time online as they did a decade ago, reaching over 15 hours each week in 2015. But even for children who have grown up with the internet - so-called digital natives - there's room to improve their digital know-how and understanding. For example, children do not always question what they find online. One in five online 12-15s (19%) believe information returned by a search engine such as Google or Bing must be true, yet only a third of 12-15s (31%) are able to identify paid-for adverts in these results. Nearly one in ten (8%) of all children aged 8-15 who go online believe information from social media websites or apps is "all true" - doubling from 4% in 2014. Children are increasingly turning to YouTube for "true and accurate" information about what's going on in the world. The video sharing site is the preferred choice for this kind of information among nearly one in ten (8%) online children, up from just 3% in 2014. But only half of 12-15s (52%) who watch YouTube are aware that advertising is the main source of funding on the site, and less than half (47%) are aware that ‘vloggers' (video bloggers) can be paid to endorse products or services. 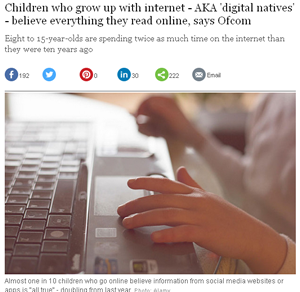 James Thickett, Ofcom's Director of Research, said: "The internet allows children to learn, discover different points of view and stay connected with friends and family. But these digital natives still need help to develop the know-how they need to navigate the online world." Children aged 12-15 were split about whether being online helped them be themselves, with around one third (34%) agreeing and a similar amount (35%) disagreeing. The remaining 31% were unsure whether being online helped them be themselves or not. Most 12-15s (72%) believe that most people behave differently when they're online, with girls more likely to say this happens than boys (78% versus 67%). More than two thirds (67%) of girls aged 12-15 with a social media account said there were things they dislike about social media. Nearly one in three (30%) were concerned about people spreading gossip or rumours and a quarter (23%) said people can be "nasty, mean or unkind to others". This compared with just over half of boys aged 12-15 (52%) reporting things they dislike about social media. Many children are also concerned about spending too much time on the internet. Around one in ten online children aged 8-15 (9%) say they dislike spending too much time online, and nearly one in three 12-15s (31%) admit they can sometimes spend too much time on social media in particular. More than nine in ten parents of 8-15s (92%) manage their children's internet use in some way - either through technical tools, talking to or supervising their child, or setting rules about access to the internet and online behaviour. Nearly four in ten parents (38%) use all four approaches. Among the technical tools used by parents are network-level content filters offered by broadband providers. Almost six in ten parents of 8-15s (56%) are aware of these parental controls, up from 50% in 2014, and a quarter (26%) use them, up from 21% in 2014. It appears that the vast majority of children do hear the advice given about staying safe online. Some 97% of children aged 8-15 recall advice they've been given, particularly from parents. The large majority (84%) of children aged 8-15 also say they would tell their parents, another family member or a teacher if they saw something online they found worrying, nasty or offensive. However, 6% of children say they would not tell anyone.